It’s April, and I’m still waiting for spring to bring some warm weather. Though in terms of business, I almost wish that things would cool off slightly! We couldn’t have asked for a better March with record sales being achieved on a number of properties and lettings going as strong as ever. I am astounded by the strength of the local market at the moment. Nearly all of the properties sold last month went for their asking prices – a few exceeded the asking price. This is great news for local sellers. And it’s not just Hammersmith and Shepherds Bush homeowners that are feeling the boom. Just look at the centre of Hammersmith as wave after wave of new investment flows in. From the new-look Kings Mall – complete with a mega-sized H&M, my wife adds excitedly – and Lyric Theatre all the way down to the new plans to radically improve the area around the new town hall and you and see it’s hotting up in Hammersmith. Last month, 418 new homes, new offices, shops and restaurants on the site of the current Kings Mall car park and the West 45 office building, in Glenthorne Road, were approved by the council. The new building, which boasts living vegetation on the roofs, will include 52 studio apartments, 106 one-bedroom flats, 216 two-bedroom apartments and 44 three-bedroom apartments. 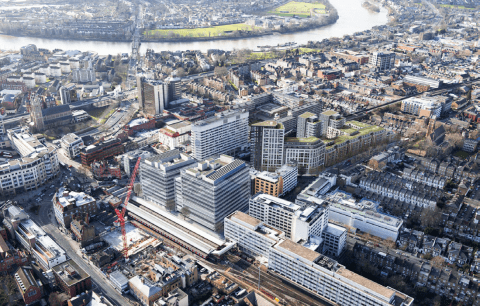 Meanwhile, Hammersmith Grove’s nine-storey office block is starting to take shape and work on its 11-storey counterpart, to create new student accommodation on the site of the former Hammersmith Palais, is well underway. Further down King Street, residents are excited by the council finally agreeing to consider adding a cinema back into their plans for the town hall. They haven’t guaranteed a cinema yet – so watch this space. But it comes after the council promised angry residents that none of the new buildings around the Grade II-listed town hall would be higher than the current, ugly town hall extension. Now trying to get the scheme passed for the second time, the council has also included a £1million regeneration fund for improvements to buildings in this stretch of King Street and the creation of a new public square. Throw in 200 new flats and retail/restaurant space and Hammersmith is going to have a whole new look in a few years. And heading towards Chiswick, the tired office blocks across the street from Ravenscourt Park are set to be replaced by new flats and shops. While at the end of King Street the mega-sized St Peter’s Place development is finally getting off the ground, with the first flats set to be built this year. Don’t blink folks, you don’t want to miss a thing!